In the 1950s, the residents of the southwestern coastal areas of Taiwan suffered greatly from Blackfoot disease (BFD) due to the consumption of arsenic-contaminated groundwater. Groundwater with high levels of arsenic in southwestern and northeastern Taiwan received much attention. After arsenic-safe tap water was utilized for drinking instead of groundwater in the 1970s, BFD cases decreased greatly. After 1990, no new BFD cases were reported, and as a consequence, BFD problems disregarded. However, arsenic is still present in the groundwater. 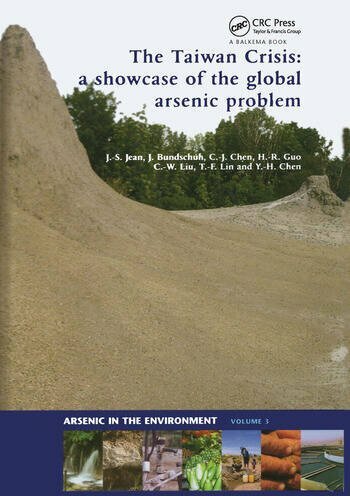 This book will improve the knowledge and understanding of the occurrence and genesis of arsenic-rich groundwaters in Taiwan. It deals with constraints on the mobility of arsenic in groundwater, its uptake from soil and water by plants, arsenic-propagation through the food chain, human health impacts, and arsenic-removal technologies. Taiwan case experiences are described in this book and can be applied worldwide. improve the international cooperation on arsenic problems worldwide. 1.6 Why was the "Taiwan signal" not immediately recognized worldwide? 1.7 Why does arsenic continue to affect people worldwide? Jiin-Shuh Jean (1952, Taiwan) finished his PhD degree in Hydrogeology, specializing in groundwater modeling, from Purdue University, West Lafayette, Indiana, USA. He is a full professor of Hydrogeology at the Department of Earth Sciences, National Cheng Kung University (NCKU), Tainan City, Taiwan. His current research interest is in arsenic mobilization and removal. He is now an associate editor of the Journal of Hydrology, Elsevier and a local chief organizer of the 3rd International Congress on Arsenic in the Environment, which will be held on 17-21 May 2010 at NCKU, Taiwan. Jochen Bundschuh (1960, Germany) has been working in international academic and technical co-operation programs in different fields of water and renewable energy resources for more than 17 years for the German government. He was a long-term professor for the DAAD (German Academic Exchange Service) in Argentina and an expert of the German Agency of Technical Cooperation (GTZ) (1993-1998). From 2001 to 2008 he worked within the Integrated Expert Program of CIM (GTZ/BA) as an advisor to Costa Rica at the Instituto Costarricense de Electricidad (ICE). Since June 2009 he has been teaching as a professor in the field of renewable energies, in particular geothermics, at the University of Applied Sciences in Karlsruhe (Germany) and is also a researcher at the Institute of Applied Research at the same university, where he works in geothermics and the groundwater arsenic issue. Chien-Jen CHEN (1951, Taiwan) graduated from Johns Hopkins University with a Sc.D. in epidemiology and became a professor at the National Taiwan University. He has been appointed as the Director of the Graduate Institute of Epidemiology, and Dean of College of Public Health in the National Taiwan University. He has published 505 original, review and editorial articles in refereed journals, which have been cited more than 13,000 times. He has received many accolades and awards for his research achievements, including the Presidential Science Prize, the most prestigious science award in Taiwan. HOW-RAN Guo (1961, Taiwan) obtained his medical degree in 1988 at the Taipei Medical College (currently the Taipei Medical University), Taipei, Taiwan. He continued his study at the Harvard School of Public Health, Boston, Massachusetts, U.S.A. and earned an M.P.H. (1989), a M.S. in Epidemiology (1990), and a Sc.D. in Environmental Health, with a major in Occupational Medicine (1994). Currently, he serves as the Chair of the Department of Occupational and Environmental Medicine at the National Cheng Kung University as well as the Director of the Department of Occupational and Environmental Medicine at the National Cheng Kung University Hospital, Tainan, Taiwan. Chen-Wuing LIU (1955, Taiwan), PhD, is a professor in the Department of Bioenvironmental Systems Engineering at the National Taiwan University and since 2007 has been the President of the Taiwanese Soil and Groundwater Environmental Protection (TASGEP). Liu holds a PhD from the University of California at Berkeley in Hydrogeology. Tsair-Fuh LIN (1963, Taiwan), PhD, is a distinguished professor in the Department of Environmental Engineering (DEnvE) at National Cheng Kung University (NCKU), Tainan City, Taiwan. Since 2009, he has served as the Department Chair of DEnvE at NCKU, Secretary-General of the Chinese Institute of Environmental Engineers in Taiwan, and Chair of the Specialist Group in Off Flavours in the Aquatic Environment, International Water Association. Yen-Hua CHEN (1976, Taiwan) received her B.S. and M.S from the Earth Sciences Department at National Cheng-Kung University, Taiwan, in 1997 and 1999, respectively. She received a Ph.D. from the Material Sciences and Engineering department of the National Tsing-Hua University, Taiwan, in 2006.